Shown here is the original clothing belonging to my Izannah Walker doll. I have drafted patterns from these pieces. 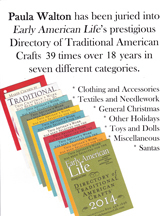 This is a printed pattern with printed instructions and is an invaluable resource for both collectors of antique dolls and for doll makers. This pattern is intended for experienced seamstresses only – it should not be attempted by beginners. Your purchase of this pattern includes unlimited telephone and email support. I am happy to answer any questions you may have about the instructions and provide additional help as needed. I have also started a blog, Izannah Walker Journal at www.izannahwalker.com, that provides information about Izannah Walker dolls in general, sources for fabric and notions, and other information you may find helpful when using this pattern. Note: Limited use by doll makers who sell their works is allowed, as long as credit is given, with each doll sold, to Paula Walton of A Sweet Remembrance for the clothing pattern. No other commercial use is allowed. I have drafted patterns from the original clothing belonging to one of my antique Izannah Walker dolls. This is a printed pattern with printed instructions and is an invaluable resource for both collectors of antique dolls and for doll makers. This pattern is intended for experienced seamstresses only – it should not be attempted by beginners. This is a hand drawn pattern with printed instructions, drafted from an antique in my collection. The pattern is drafted in the original size (small) with adjustment lines given to enlarge. The apron is cut as one continuous piece and was made to fully utilize 36 inch wide fabric. Complete pattern and instructions for 5 and 9 inch common linen dolls and their dresses. This pattern is based on an illustration and instructions first published in the American Girl’s Book in 1831 and as seen in my article, A Common Linen Doll, on pages 67-69 in the Christmas 2009 issue of Early American Life magazine. No photo available of this set of classroom handout patterns. These are the patterns that I drafted for my class on 18th and 19th century cloth dolls. They are being offered here as an aid for students who may have lost their original set. This pattern features several different bodies, arms, and legs which are interchangeable and allow you to mix and match them to create a variety of different cloth dolls. This page is currently under construction ❤ Thank you for you patience.